Good morning. How is sweater weather going for you, because I am wearing a sweater pretty much every day, nowadays. 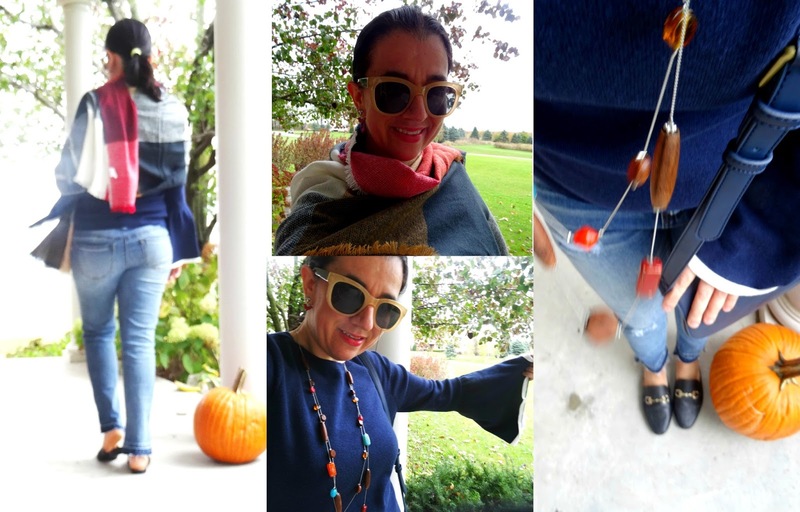 Today I am sharing two casual, mom-friendly looks sharing two pairs of Blue Jeans worn with different Sweaters. 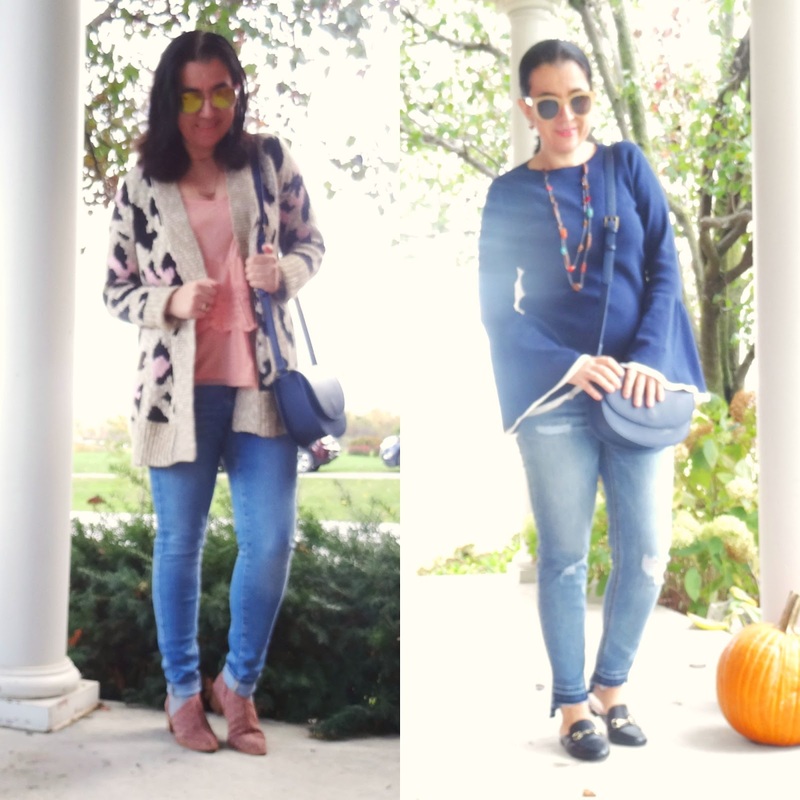 Both of these types of outfits are a Fall Uniform for me and if you have been reading here the last 4-5 weeks or so, you have seen a version of these outfits: jeans or leggings with a tee/cami and a long cardigan on top, or jeans with a sweater, sometimes layered with a blanket scarf over it - like today - and sometimes layered with a collared shirt underneath it. 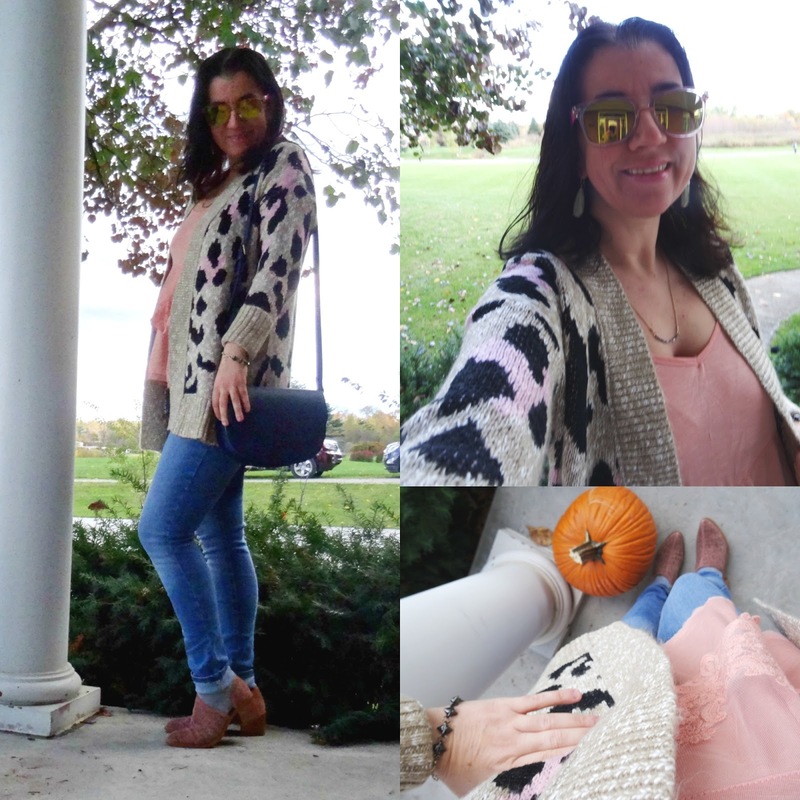 For the first outfit above I paired some Simple Skinny Medium-Wash Blue Jeans I currently bought with a Blush/Soft Pink Ruffled Lace Camisole and a Long Cardigan which is this cozy Tan+Pink+Black Leopard Print Cardigan and all these three pieces are from Target. I was looking for a pair of normal, not-distressed high-waist jeans and I found them at Target from the Mossimo brand. They are these ones (linked in the dark wash blue which I need also), and also the cozy leopard cardigan is current from Target and it is this one - I absolutely loved it. I could have done the size S on the cardi but I went for the M which I like better. For the second outfit I am wearing the same Step-Hem Jeans I have been wearing all October for the Common Threads Challenge and I paired them with a Navy Bell-Sleeve Sweater which I purchased at Nordstrom during the NSale but I found this current ribbed sweater which is very similar to mine. I love the subtle way I wore pink here, still honoring Breast Cancer Awareness month, especially since the frame of my sunglasses are exactly that shade of pink. The Coral-Blush/Pinkish Ruffled Camisole with the lace can be dressed up or down (like I did here) and it matched both the light pink blush in my cardigan and the color of my lipgloss. Keeping it pastel-y, I also added some Aqua Teardrop Earrings. Like I already mentioned this Beautiful Navy Bell-Sleeve Sweater is from Nordstrom and it is in a soft cotton-blend knit. I love it. I totally dressed it down this tie around with my Step-Hem Mom Jeans and this Colorblocked Poncho purchased last Winter from Wal Mart (believe it or not). 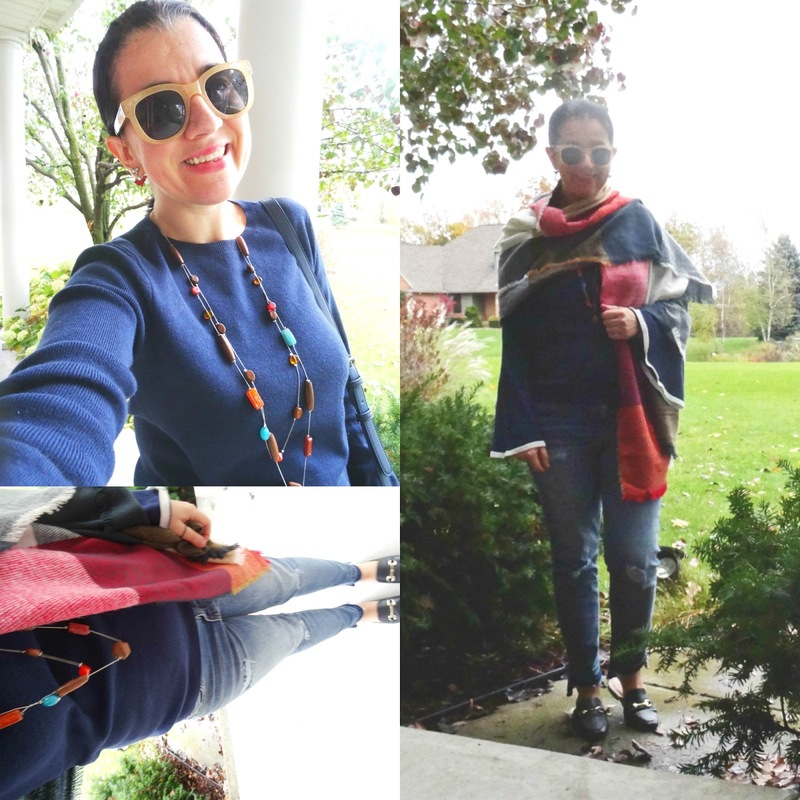 I love how well my long, colorful beaded necklace ties in the outfit's colors all together. It matches the blanket scarf, perfectly. My own navy sweater is sold out but the ones I linked both in the outfit links and the widget below, are very similar. I like the stripe on the edge of the sleeves. Also, how awesome is my Tan/Blush/Black Leopard Long Cardigan. For a better, looser fit or to layer easier and if you are between sizes, size one up. So, you may or may have not noticed these Gorgeous Black Mules. They totally look exactly like the original Gucci pair don't they?! Well, except the Gucci Mules are 100 times more $$. They come with a fur-lined option too (STEAL version or SPLURGE version). I actually found some fur-lined soft dusty pink mules like these on Target.com that I cannot wait to wear, soon. And you guys have been loving my State 1 Mauve Perforated Asymmetric Booties which I got at Nordstrom during their big sale. You can still find them there and they come in several neutral colors. I have already worn them over a dozen times and love them. I once again wore the booties with socks to keep my feet warm - just simple heather grey cotton socks. Target has some similar and inexpensive Perforated Booties and they also have a an Open Peep-Toe Stacked Heel version which I love and a a Mule style by DV which I just ordered online. Speaking of Target, all of their shoes are currently 20% OFF so it is time to stock up on shoes for you and your family. This sale will only last until Wednesday. I picked up some boots for me and some boots and sneakers for Vivian, too.